Through the wonders of Pinterest, I have found a couple of festive baking projects I want to serve this Christmas but I am always keen to do a test run of something new, to get my inevitable rookie mistakes out of the way so that I’ve got a better chance of achieving something lovely the second time. 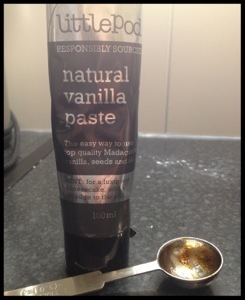 Instead of the usual vanilla extract, I used this paste, in which you can see the teeny tiny vanilla seeds. Lovely flavour and worth investing in. I used a small round cutter to create canapé-sized bites. The original recipe used buttercream to create the white fur trim on the Santa hats but I suspect this might be a bit of a sugar overload so I have chosen whipped cream instead. 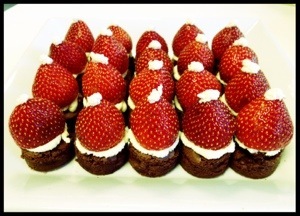 It’s brilliantly simple: pipe cream onto each brownie bite, top it with a (in my case, environmentally-unforgivable Egyptian) strawberry, and top that with a whipped cream bobble. Pleasing. 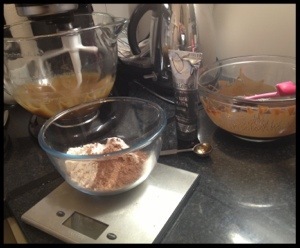 Have a 2 tbsp flour on hand in case your colouring and flavouring knocks the texture out of whack. This recipe required a little creativity as I don’t have a food processor. I started by using a stick blender, which I hoped would do the same job but unfortunately its little blades got rather clogged up with the butter and it started to buckle under the pressure of the job, so I used a combination of wooden spoon and Kitchen Aid to finish combining. The batter is pretty sticky which makes it tricky to handle at times, but it produces a wonderfully light,short, buttery biscuit. Must remember next time to roll the layers more thinly (and more precisely) so that it’s easier to roll up into a uniform spiral. 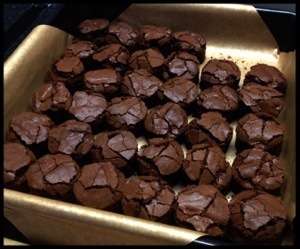 Must also remember next time to give each biscuit much more space, because they spread quite a lot when baking. 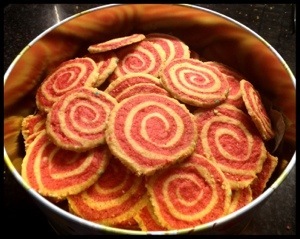 Square-ish spirals – not so pleasing. Also must line the sheet – as the recipe states – with baking paper rather than Lakeland’s wonderful foil-backed parchment, as the edges of the latter start to curl in the oven and push the edges of the biscuits back, which does not a perfect batch of biscuits make. A bit odd-looking but tasty, and valuable for the lessons I have learned in the process. This entry was posted in Cooking & Baking and tagged Christmas baking, festive baking, Red Spiral Biscuits, Santa Hat Brownies, sweet canapes by wordspicturesandcake. Bookmark the permalink.